seriousgamesresearch and a long-term relationship. Tis leads us to the frst question you should ask of a learning game provider: 1) HOW HIGH IS THE GAME'S COGNITIVE FIDELITY? All simulations and games abstract reality — in this example, by representing the key features of a negotiation, while simplifying or omitting irrelevant features. Te trick is that a skill such as negotiation is a series of complex decisions you make as you gather information, so the key features are the principles of assimilating the information and then selecting the right negotiating strategy and tactics. In this sense, a major review of research by Sigmund Tobias and Dexter Fletcher concludes that what we can call cognitive fdelity is crucial: faithfully representing the information and decision-making at the core of the skill, both at the expert level, and at the level of a beginner. Tis is the biggest challenge in designing a serious learning game. To achieve high cognitive fdelity, Merchants includes a negotiation simulator that runs in parallel with the game engine. Te simulator gives the learner (who assumes the role of a young merchant in 15th century Venice) a range of communication and negotiation strategy options. It's up to the learner to ask questions of the other party to uncover his or her interests and build trust. To resolve the confict posed by each scenario in the game, the learner must creatively discover and include variables to create a mutually benefcial agreement. Te negotiations simulator in Merchants does a good job of avoiding the common design errors of imposing too much procedural structure on the task or restricting the range of response options so much that the nature of the decision-making skill is lost. As a result, it produces a learning game with high cognitive fdelity. High cognitive fdelity also helps to assure that your learners will fnd the game relevant and engaging. 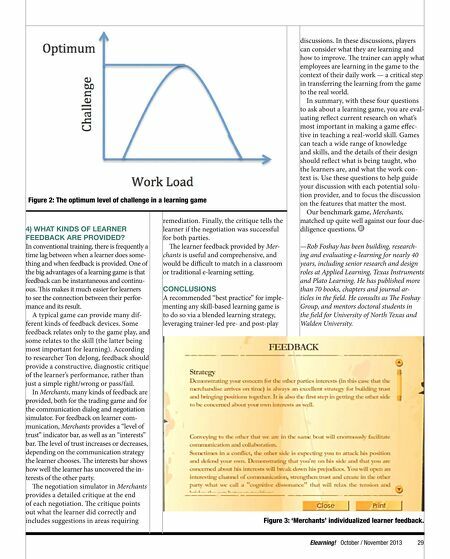 2) HOW IS MENTAL WORKLOAD DIVIDED BETWEEN THE SKILL BEING TAUGHT AND THE GAME PLAY? Tere is a natural tension between the mental workload requirements of game play and the requirements of performing the skill the game is designed to teach. It's very easy to create a game that is so engrossing that playing it distracts the learner's attention and efort from the key task of mastering the skill being taught. Tobias and Fletcher's review of research concluded that getting the balance right between the game and the skill is critical. Figure 1: The 'Merchants' communication simulator. 'Merchants' was designed and developed by Gamelearn, S.A. and is distributed in the U.S. by Game On! Learning 28 October / November 2013 Elearning! In Merchants, the game play is based on building wealth by buying ships and assigning them to trade routes. Successful negotiations also add wealth within the game. However, the details of the game play and the wealth computations happen mostly in the background, and the learner focuses on them for just a few minutes at the beginning and end of each level of the six-level game. On the other hand, the negotiation simulator runs the six negotiation scenarios, which comprise more than 80 percent of total play time. Tis provides an appropriate balance between the competitive game play and the application-level learning and mastering of the skill. 3) IS THE LEVEL OF CHALLENGE APPROPRIATE FOR MY LEARNERS? Research has shown that it's critical to get the level of challenge right within a learning game. If it's too easy, learners will lose interest and quit; if it's too hard, learners will give up in frustration or will play the game mindlessly without attention to the real learning task. If the level of challenge is balanced correctly for your learners, they will fnd the problems they solve to be intrinsically motivating and fun. Figure 2, based on research by S.H. Hsu, M.H. Wen, and M.C. Wu, illustrates this point. Of course, as the learner begins to master the skill being taught and gains more experience playing the game, his or her optimum level of challenge increases. Game designers use a wide variety of techniques to adjust challenge level accordingly. For example, in Merchants, the number of negotiation variables to be discovered and incorporated in each negotiation strategy increases from two or three in Level 1, to more than a dozen in the latter levels of the course. Unfortunately, level of challenge is in the mind of the learner. Te level of challenge for you as an instructional designer, or for your subject-matter expert, will be diferent from that experienced by the learner. Te only valid way to fnd out if the level of challenge (at each level of play) is right for your learners is to have representative learners from your target audience play the game and tell you. Pilot-test the game with the target audience for the training, not with trainers who don't perform the job every day.